The global retail sector is undergoing a significant disruption from technology-based innovations. Online eCommerce is part of the story, but there's nearly as many dramatic changes occurring within physical retail stores -- particularly at the point of sale (POS). A POS terminal is an electronic device used to process card or contactless mobile payments at retail or merchant locations such as stores, restaurants etc. The terminal can be owned by the retailer or an acquirer-owned terminal (i.e. provided on a rental basis to the merchant). According to the latest market study by Juniper Research, the global value of contactless POS terminal transactions -- conducted in-store via cards, mobile phones and wearables -- will approach $500 billion annually by 2017; that's up from an estimated $321 billion this year. However, the low value nature of contactless payments means that it will only represent just 5 percent of the total value of all worldwide POS transactions in 2017. According to the study findings, a surge in contactless-enabled POS terminals occurred in 2015, mostly related to retailer obligations to card companies in many markets, to ensure that all terminals will be contactless ready by 2020. This upgrade is likely to prompt new growth in the migration to more contactless payments. For example, Visa announced more than 3.2 million contactless terminals in Europe as of April 2016 -- that's up by 23 percent from 2.6 million at the end of April 2015. 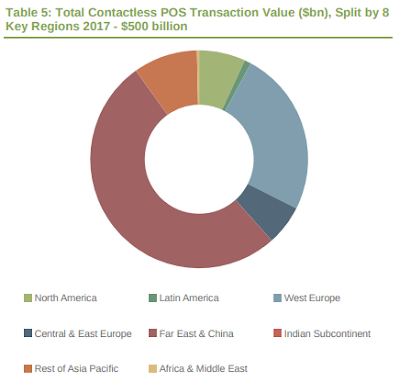 Contactless terminals now account for a significant minority of terminals in many regions (and in a majority in several national markets) and, as of the end of 2015, numbered 15.3 million -- or nearly 20 percent of all POS terminals worldwide. According to the Juniper Research assessment, these numbers will increase sharply over the next 5 years, with contactless accounting for more than 2 in 3 POS terminals by 2021. Their research uncovered limitations in some markets. "This is mainly due to the lack of widespread availability of supporting POS contactless reader terminals, and also that some potential users are likely to remain cash-centric," said Nitin Bhas, head of research at Juniper Research. For example, Germany remains a highly cash-centric economy, with cash still accounting for around 57 percent of all in-store retail transactions, based on the value of sales. Contactless cards will represent 1 in 2 payment cards in issue by 2020. Smartphone and tablet-based mPOS terminals will handle 20 percent of all retail POS transaction value by 2021.